Nacho Cheese Sauce is delicious and super easy to make! Munch on some creamy homemade cheese sauce with tortilla chips or load up all your favorite toppings and make a nacho platter! The best part of any sports gathering is the food, am I right? Yes, yes it is, so why not make an easy nacho cheese sauce the whole crowd will love! Anyone in your household enjoys watching football? If so, you’ve probably had the games on your TV non-stop for months! I can’t remember the schedule, but it felt like every single day of the week there was some type of BIG game going on. It became background noise for me as I went about my usual household business, but Alan and our son Sam were dedicated to EVERY single game! Since Sam graduated from high school, going to a Friday night football game came to a halt for us. Cheering our son and his team from the sidelines, eating Polish dogs and nachos (chips with cheese sauce) from the food booth was a lot of fun, but being in the thick of the excitement is completely different from watching sports in your living room. It is for me, anyway. Now, any game we watch from or living room is all about the FOOD! I mean who doesn’t love a good excuse to dig into a nacho cheese platter?! For extra flair include diced jalapeños, ground beef or Rotel tomatoes or diced green chiles! 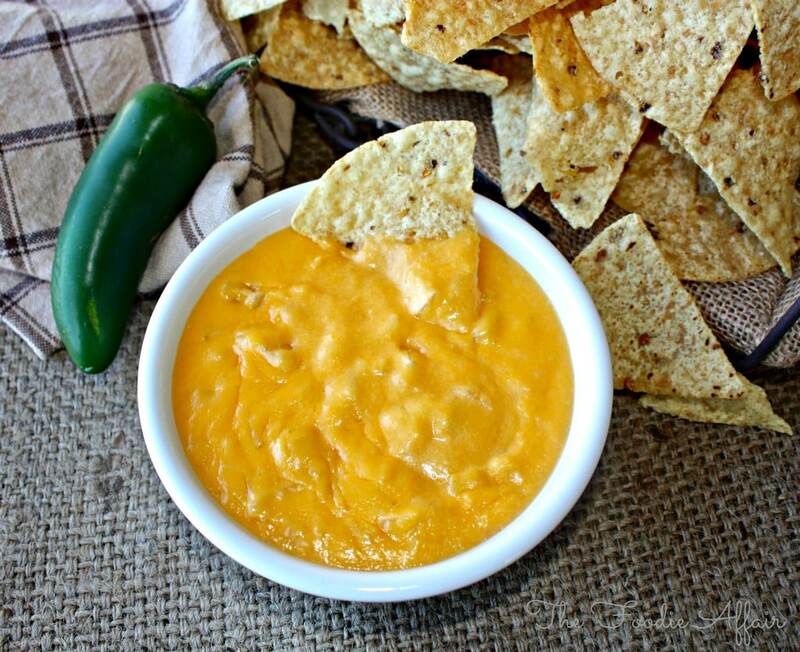 Once you taste this nacho cheese dip, you will never contemplate eating rubbery pre-made cheese sauce again! If you prefer specific instructions on how to load up a nacho platter, then check out this loaded nachos recipe! This is a basic easy to make nacho cheese sauce. 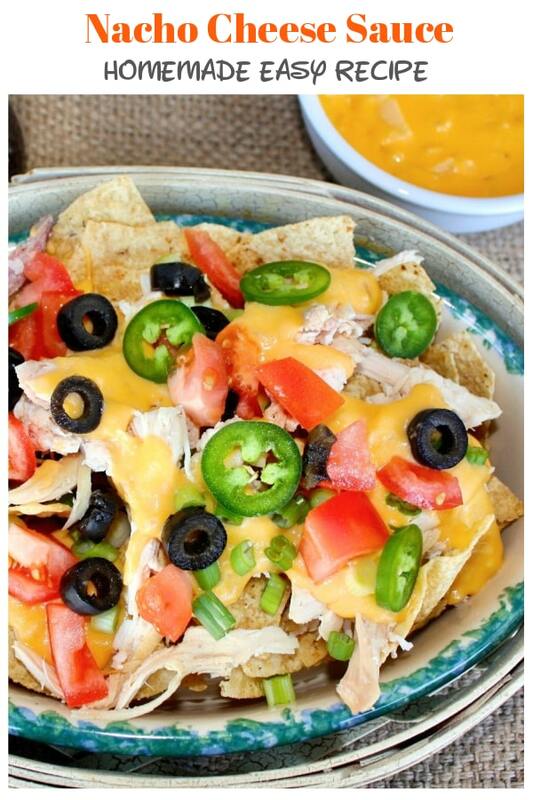 Dip your chips right into the bowl or drizzle the cheese over a plate of favorite nacho toppings. In a medium saucepan, melt butter on medium heat. Add onion and sauté until fragrant and soft. Add Garlic and blend into onions. Add flour incorporating into the onion mixture, stirring for about 2 minutes (mix will be thick). Add milk and begin adding cheese one cup at a time. Stir until melted and warm (approximately 5 minutes). 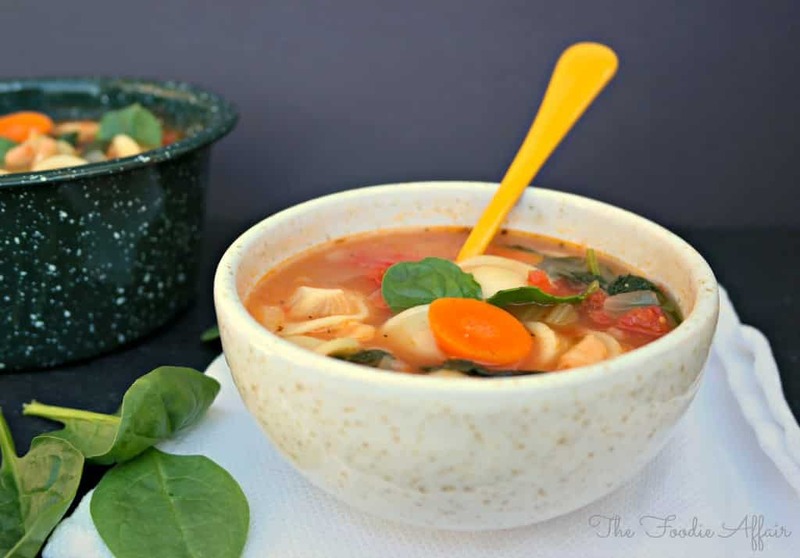 This recipe is a must for Super Bowl Sunday! That’s an easy cheese sauce, love the looks of your nacho so colorful and healthy. I happened to look at a velvetta package and was surprised at the ingredient list. Blah! I’m glad I never cared for it. Making your own cheese sauce is so easy!! 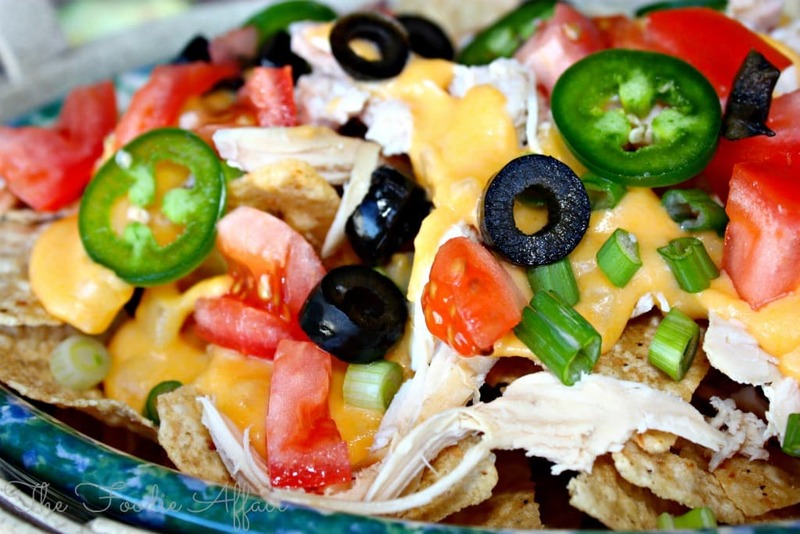 Every football party needs nachos like this. Love those photos shots, you are making me hungry. 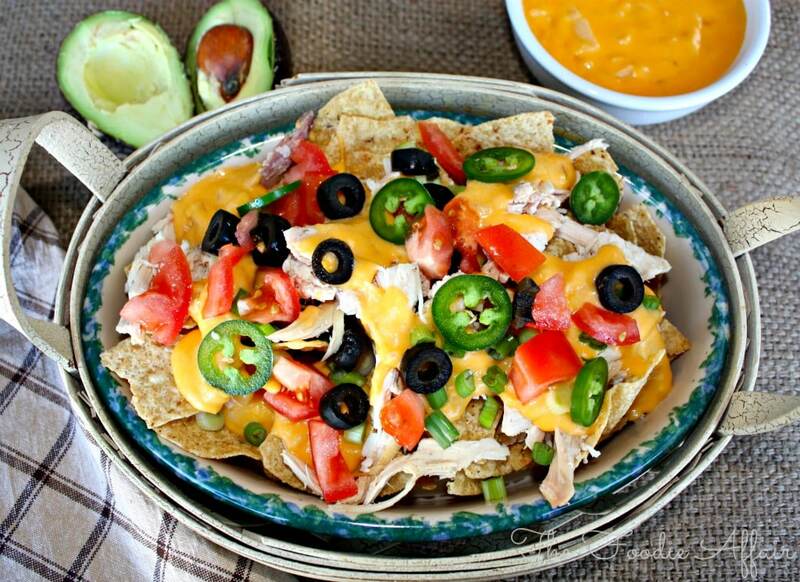 I’m making this recipe the next time we have nacho cheese sauce!!!! It looks so much better than the stuff sold in the store. I’m sure it tastes better too since it’s homemade and uses fresh ingredients! It’s soooo much better than store bought. I also put this on a baked potato…yum! Thank you for this tasty recipe. I was so relieved that it wasn’t too difficult for an extreme non-cook like me to make. I was worried the cheese texture would be less than desirable but it came out nice and smooth. One question, though: what spice(s) would you add to this recipe to give it some heat? Hi Liz! I’m glad you enjoyed this recipe! You can always used diced green chills (in a can) or dice a fresh jalapeño. A dash of cayenne pepper is another option. 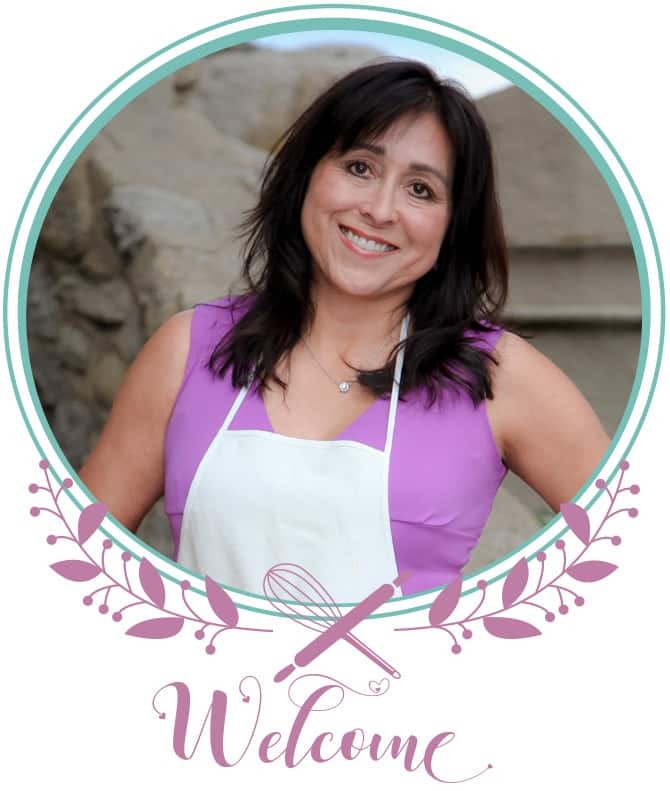 Would love to hear how your spiced it up! Will it work okay to make this cheese sauce on the stovetop and then transfer to a crock pot to keep it warm for serving for a couple of hours? Will the cheese sauce stay at the right consistency? Hi Sarah, I haven’t tried keeping this cheese sauce warm in the crockpot, but I think it will work fine. You may need to periodically stir it so a film doesn’t form. It will thicken it gets too cool, but if you add a little milk and reheat it, it’ll be back to dipping consistency. Hope this helps! Thanks Sandra! 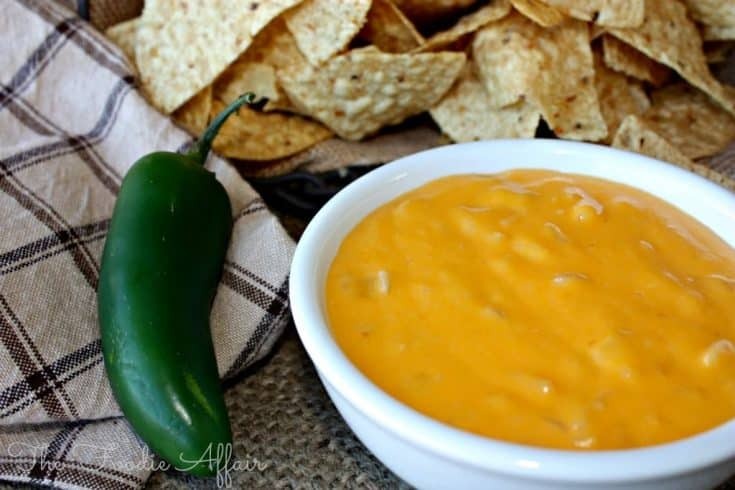 My husband is a foodie and I wanted to make a yummy nacho cheese sauce for him. I figured I’d use a recipe like yours. How do you think your recipe compares to a recipe using Velveeta instead of all the freshly grated cheese? Is the flavor much better with your recipe? Is the consistency similar? I hope he loves it 🙂 Thanks for stopping by, Sarah! Made the nacho sauce today. It was very good. I added some jalepenio cheese to it for a little kick. Delicious! I made this easy sauce last night for some New Year’s nachos for the family and it turned out perfect! Real cheese doesn’t even compare to the fake stuff. Thanks for the easy hook up! So good to hear, Katia! This is so easy to make too. Try it on baked potatoes next time – yummy!